Easy on the eye avant-garde design. The Sarrazin Design office has been established in Vendée for nearly 30 years, just a short distance from Beneteau’s headquarters. It has contributed to the aesthetic and functional success of thousands of products in a variety of sectors, such as the automobile, transport, health, special product, and, of course, the nautical industry. Patrice Sarrazin : We work on products and materials with light and shadow. I believe that it is crucial to stay keen and I love to go to trade shows to keep my ears open! To be good at this job, you also need to be a dreamer and rejuvenate your vision. Sometimes I’m also slightly idealistic! But, industrial design primarily involves respecting people around you. Observing, listening, understanding needs requires unbroken attention. Whatever the product, it must live with the light, its material, its beauty and its reliability. And it must be constantly pleasant to behold. Creative imagination can sometimes be completely off the wall, out of curiosity and passion. Ideas need to be filtered many times, to take shape and become reality and one such filter is the restrictions. This is what improves them and results in their creation. So it is with Beneteau’s marketing and technical teams that we fulfil our dreams, acting on our vision and turning our projects into reality. We work on everything located above the waterline. Every part on a boat is technically very sophisticated and the specifications are highly specialised. However, we must not be led away from our mission, which remains, above all, “to create style”. Initially, people come to see us for our “artist’s touch”, the stroke of our pen, and inspiration. Then, and only then, comes the CAD modelling and we must take all the details you do not see into consideration, such as the many elements and technical accessories that you find inside a boat, the size of the engine, etc. Finally, we dwell on the main details. However, there should be no insignificant details in design. They give the project coherence and the feeling that the object is well-designed. This can be the choice of materials, fabrics, and upholstery, but also types of seams, yarn colour, down to the small edging that emphasises a curtain’s line. The first time we worked with Beneteau dates back to the year 2000. Our job was to create two very different boats on the basis of the same hull: the Antares 12 (which would become the Antares 42 with an evolution in style) was aimed at cruising, and the Flyer 12, which was sportier and a more stylish boat. 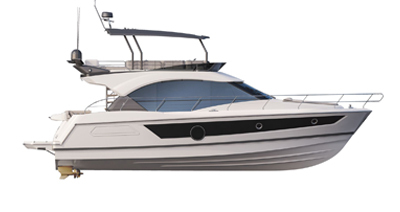 The strong connections forged with the powerboat design office at Beneteau then led the office, managed by Patrice Sarrazin, to design the entire Antares range (inboard and outboard) and Barracuda range. Patrice Sarrazin : The creation of the Barracuda range was a wonderful challenge and we have just completed the last model. I remember the meeting with Beneteau, during which we found the name of this new range. “Barracuda”: an awe-inspiring, powerful and noble fish. The boat would be a winner; determined and powerful. These are powerful moments in the creation process.